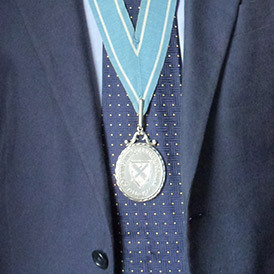 Throughout the Society’s history many notable people have been Fellows of the Society of Antiquaries of Scotland, as well as Patron and Honorary Fellow positions (past and present) held by members of the Royal family. John Stuart, 3rd Earl of Bute, FSA Scot (b.1713 – d.1792) Scottish nobleman and a close relative of the Clan Campbell, he succeeded to the Earldom of Bute upon the death of his father. He served as Prime Minister of Great Britain (1762–1763) under George III. William Smellie FRSE FSA Scot (b.1740 – d.1795) Scottish master printer, naturalist, antiquary, editor and encyclopedist, and a co-founder of the Society of Antiquaries of Scotland. Hired by Colin Macfarquhar and Andrew Bell to edit the first edition of the Encyclopedia Britannica. 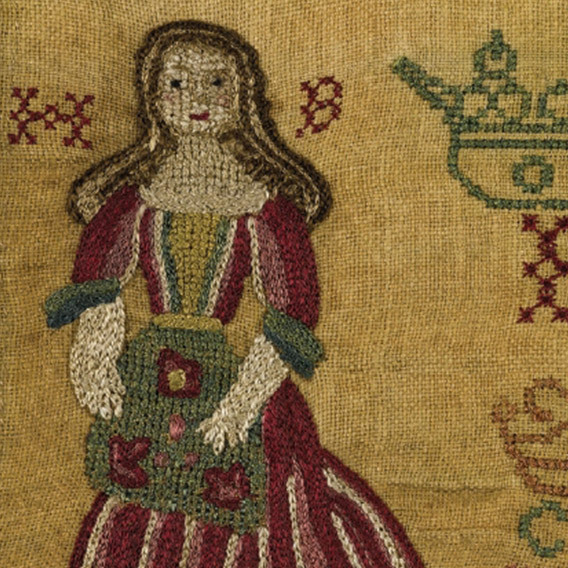 Smellie also edited William Buchan’s Domestic Medicine, the Scots Magazine, and the first transactions of the Society of Antiquaries of Scotland. David Steuart Erskine, 11th Earl of Buchan, FSA Scot (b.1742 – d.1829) Scottish antiquarian and patron of the arts and sciences. In 1780 he founded of the Society of Antiquaries of Scotland and was appointed its first Vice-President (1780 – 1790). Daniel Rutherford FRSE FLS FSA Scot (b.1749 – d.1819) Scottish physician, chemist and botanist who is most famous for the isolation of nitrogen in 1772. He was a joint founder of the Royal Society of Edinburgh (RSE). He was a Fellow of the Society of Antiquaries of Scotland. He was a professor of botany at the University of Edinburgh and the 5th Regius Keeper of the Royal Botanic Garden Edinburgh from 1786 to 1819. He was president of the Royal College of Physicians of Edinburgh from 1796 to 1798. Rutherford was also the uncle of Sir Walter Scott. Walter Scott FRSE FSA Scot (b.1771 – d.1832) Scottish historical novelist, playwright, poet, advocate and antiquary. Many of his works remain classics of both English-language literature and of Scottish literature. Famous titles include Ivanhoe, Rob Roy, The Antiquary, Waverley and The Heart of Midlothian. He was also an antiquary, collector and member of the Highland Society and President of the Royal Society of Edinburgh (1820–32). He became a Fellow of the Society of Antiquaries of Scotland in 1796, and was Vice-President of the Society in 1827, 1828, 1829. David Laing FSA Scot (b.1793 – d.1878) An expert on Scottish history, art and literature, and a great collector of manuscripts, rare books and historical portraits. A Scottish antiquary and for over fifty years a member of the Society of Antiquaries of Scotland, where he contributed over a hundred papers to the Society’s Proceedings. Cosmo Nelson Innes FRSE FSA Scot (b.1798 – d.1874) Scottish advocate, judge, historian and antiquary. He was a skilled decipherer of ancient Scottish records and helped to compile, edit and index Acts of the Scottish Parliament 1124 – 1707. Robert Chambers FRSE FGS FSA Scot (b.1802 – d.1871) Scottish publisher, geologist, author and journal editor who, like his elder brother and business partner William Chambers, was highly influential in mid-19th century scientific and political circles. Chambers was the anonymous author of Vestiges of the Natural History of Creation, which was so controversial that his authorship was not acknowledged until after his death. William Forbes Skene FSA Scot (b.1809 – d.1892) Scottish historian and antiquary. The second son of Sir Walter Scott’s friend, James Skene (1775–1864), of Rubislaw, near Aberdeen. Educated at Edinburgh Academy and at the University of St Andrews. His chief work, however, is his Celtic Scotland, a History of Ancient Alban (3 volumes, 1876–1880), perhaps the most important contribution to Scottish history written during the 19th century. James Young Simpson FSA Scot (b.1811 – d.1870) Scottish obstetrician and a significant figure in the history of medicine. His intellectual interests ranged from medicine, anatomy to archaeology. He was the first physician to demonstrate the anaesthetic properties of chloroform on humans and popularised the drug for use in medicine. Christian Maclagan (b.1811 – d.1901) Scottish antiquary and arguably Scotland’s first female archaeologist. 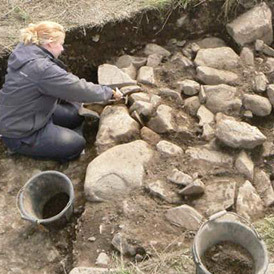 One of her primary interests were in the brochs of Scotland and was one of the pioneers of stratigraphic excavation. She devised a special method for taking rubbings from sculptured stones. Such as her meticulous collection of rubbings of Celtic Christian crosses and Pictish symbol stones. The Society did not admit female Fellows until 1901, so she could only be a ‘Lady Associate’ (admitted in 1871), and as such was not allowed to formally publish with the Society. James Drummond FSA Scot (b.1816–d.1877) Artist and antiquarian. Born in Edinburgh at John Knox’s House and trained as a draughtsman. Drummond is most well-known for history paintings (e.g. The Porteous Mob (1855). In 1848 he became a Fellow of the Society of Antiquaries of Scotland, later a member of Council and Joint Curator of the Museum. From 1868 until his death he was curator of the Scottish National Gallery. Daniel Wilson FSA Scot (b.1816 – d.1892) Scottish artist and antiquary who was the first English speaker to apply the Danish approach to prehistoric archaeology outside Scandinavia of ordering artefacts according to the Three Age System. Alexander MacMillan FSA Scot (b.1818 – d.1896) Born in Irvine, Ayrshire, Scotland, was a cofounder, in 1843, with his brother Daniel, of Macmillan Publishers. He expanded the company into a worldwide organization and also started publishing magazines, including the prestigious scientific journal Nature. Alexander’s brother Daniel was grandfather of Harold MacMillan, who became Prime Minister of the United Kingdom. Joseph Noel Paton FRSA, FSA Scot (b.1821 – d.1901) Scottish artist, illustrator and sculptor. He was also a poet and had a deep interest in and knowledge of Scottish folklore and Celtic legends, and a well-known antiquary, with specialty arms and armour. His knowledge of Celtic legends and Scottish folklore is reflected in his paintings. David MacGibbon FSA Scot (1831–1902) Scottish architect, partner in MacGibbon and Ross architect firm and co-author of The Castellated and Domestic Architecture of Scotland – From the Twelfth to Eighteenth Century (published in 1887). In 1880 MacGibbon was elected president of the Edinburgh Architectural Association and organised a major exhibition at the Royal Scottish Academy. William Galloway FSA Scot (b.1832 – d.1897) An architect with a distinct archaeological bent, particularly interested in early ecclesiastical buildings and sculpture. Best known for his work at Whithorn Priory. Also interested in Viking-age burials in Colonsay and collaborated with Sir Henry Dryden on surveys of St Magnus Cathedral and Iona Abbey. Joseph Anderson FSA Scot (b.1832 – d.1916) Scottish antiquarian who served as Keeper of the National Museum of Antiquities of Scotland from 1870 to 1913 and one of the most important figures in the development of archaeology as a discipline in Scotland, straddling the worlds of antiquarianism and scientific rigour. Alexander Henry Rhind FSA Scot (b.1833 – d.1863) Scottish antiquarian and archaeologist and a Fellow of the Society. He excavated and published a number of prehistoric sites in northern Scotland in the early 1850s and donated the finds to the Society of Antiquaries of Scotland (now in National Museums Scotland). Along with his 1600-volume library he left a bequest to the Society of Antiquaries of Scotland to fund a lectureship, and the prestigious Rhind Lectures currently hosted by the Society commemorates his name. Thomas Ross FSA Scot (b.1839 – d.1930) Scottish architect (and partner of MacGibbon and Ross), best known for surveys of Scotland’s architectural heritage and co-author of The Castellated and Domestic Architecture of Scotland (1887). Born in Edinburgh In his early Edinburgh years Ross’s closest friend was Alexander Graham Bell of telephone fame, a distant relative, with whom he remained in touch until Bell’s death in 1922. Hippolyte Jean Blanc FSA Scot (b.1844 – d.1917) Scottish architect, born and lived in Edinburgh, and best known for his church buildings in the Gothic revival style, he was also a keen antiquarian who oversaw meticulously researched restoration projects. He designed and oversaw the construction of numerous church buildings and secular buildings and parks in Edinburgh. In 1910 he was appointed to a Royal Commission which oversaw British involvement in International Exhibitions in Brussels (1910), Rome (1911) and Turin (1911). Isabella (Ella) Christie (b.1861-d.1949) One of the first two women elected to the Society of Antiquaries of Scotland in 1870-71 as a ‘Lady Associate’ – as the Society did not admit female Fellows until 1901. She was, first and foremost, an explorer travelling well beyond Europe and was elected a Fellow of the Royal Scottish Geographical Society (RSGS) in 1911. Henri Édouard Breuil FSA Scot (b.1877 – d.1961) often referred to as Abbé Breuil. A French Catholic priest, archaeologist, anthropologist, ethnologist and geologist. He is noted for his studies of cave art in the Somme and Dordogne valleys as well as in Spain, Portugal, Italy, Ireland, China with Teilhard de Chardin, Ethiopia, British Somaliland, and especially Southern Africa. Sylvia Benton FSA Scot (b.1887 – d.1985) British archaeologist, working mainly in Greece exploring the Ionian Islands and discovered the important Minoan site in Kythera. Her principal contribution to Scottish archaeology was made between 1928 and 1930 when excavating occupation deposits in the Sculptor’s Cave, Covesea, finding evidence of human occupation from the Bronze Age, the Roman period and Pictish times. Vere Gordon Childe FSA Scot (b.1892 – d.1957) Better known as V. Gordon Childe. An Australian archaeologist and philologist who specialised in the study of European Prehistory. Working most of his life as an academic in the UK for the University of Edinburgh and then the Institute of Archaeology, London, he wrote twenty-six books and was an early proponent of culture-historical archaeology and Marxist archaeology. Dorothy Marshall FSA Scot (b.1900 – d.1992) Dorothy Marshall was, in the words of The Times Obituary, “one of the last non-professional archaeologists of international reputation”. Best known locally for her association with the Buteshire Natural History Society and the Coval Archaeological Society, she undertook many projects on Bute, in Argyll, and elsewhere in Scotland, contributing many papers on a variety of Scottish archaeological topics. Margaret Stewart FSA Scot (b.1907 – d.1986) Archaeologist. Her thesis on ‘A New Analysis of the Early Bronze Age Beaker Pottery of Scotland’ not only marked a fresh approach to the subject but also her lifelong interest. She served on many committees both local and national and was one of the founders of the Perth Civic Trust. She was also the first female Honorary Fellow of the Society of Antiquaries of Scotland. Stuart Ernest Piggott, CBE, FSA Scot (b.1910 – d.1996) British archaeologist, best known for his work on prehistoric Wessex. In 1946 he was offered the Abercromby Chair in Archaeology at Edinburgh University and succeeded in making Edinburgh an archaeology department of international standing, and continued to publish widely. Robert Baron Kerr Stevenson FSA Scot (b.1913 – d.1992) Archaeologist, numismatist and Keeper of the National Museum of Antiquities of Scotland and President of the Society 1975 – 1978. He wrote a detailed account of the history of the Museum in a book entitled The Scottish Antiquarian Tradition, edited by A. S. Bell and published to mark the bicentenary of the Society and its Museum in 1981. Marion Campbell of Kilberry FSA Scot (b.1919 – d.2000) An archaeologist, historian, antiquarian, novelist and poet. Helped to set up the National History and Antiquarian Society of Mid-Argyll in the 1950s, and for many years edited its magazine Kist. Perhaps her best known book is Argyll: the Enduring Heartland, first edition published in 1977. Her last book was Alexander III, King of Scots, published in 1999. Magnus Magnusson KBE FSA Scot (b.1929 – d.2007) Icelandic journalist, translator, writer and television presenter. Born in Reykjavík, grew up in Edinburgh and lived in Scotland for almost all of his life. He came to prominence as a BBC television journalist, and was best known as the presenter of the BBC television quiz programme Mastermind. He was the founder chairman of Scottish Natural Heritage (SNH) upon its inception in 1992.